A team of researchers led by Harvard University has created a material that can change shape and alter its stickiness when exposed to a magnetic field. The team calls its creation a “Ferrofluid-containing Liquid-infused Porous Surface” (FLIPS), which is able to change its properties through the interaction of its two composite parts: a liquid containing magnetic particles and a microstructured solid. The default state of FLIPS is flat, slick and smooth; but when a magnetic field is applied to the material, the fluid responds, taking on the shape of the solid component. 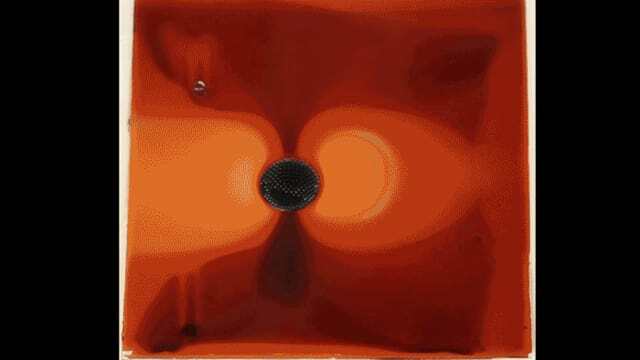 FLIPS can be tuned by controlling the properties of the ferrofluid, the shape of the solid component, the strength of the magnetic field, and the proximity of the magnets to FLIPS. By combining a structured solid surface with a responsive liquid, the material can be endlessly rewritable—much like an Etch A Sketch. “Multifunctional materials capable of performing various tasks is a new, promising area of research,” said Joanna Aizenberg, professor of Materials Science and professor of Chemistry and Chemical Biology at the Harvard John A. Paulson School of Engineering and Applied Sciences (SEAS), who is also senior author of the paper. Direct the movement of microscopic objects such as bacteria and colloidal particles. This would be useful for microscale manufacturing and for studying the behavior of mobile microorganisms. Remove biological film that accumulates on its surface. This could open up possibilities of materials that clean themselves or repel certain biological material. Coat droplets of liquid with the ferrofluid and use the malleable fluid structure to control their movement. Researchers were also able to delay mixing of the droplets and the ferrofluid, allowing for precisely timed chemical reactions. Perform continuous pumping of liquid in pipes. Act as a reversible adhesive. “Each of these applications can be further extended,” said Wendong Wang, first author of the paper and former postdoctoral fellow at SEAS. The results suggest that FLIPS could exhibit more functions and capabilities than similar multifunctional materials such as responsive gels, shape-memory polymers and liquid crystals. This could make FLIPS a platform for many future technologies: “we envision that FLIPS could be used as part of integrated control systems for the manipulation and transport of matter, thermal management, microfluidics and fouling-release materials,” the researchers concluded in their paper, which was published in Nature. Read more about the development of new high-tech surfaces at Biomimicry-Inspired Surface Can Harvest Water from the Air.